With these instructions and the included artwork, you can quickly make up a fascinating magic trick to perform in children's shows about building, construction or tools. You show a folder with over 20 different tools and have a child choose just one to think of. The child never says the name of her tool out loud, but you will magically know which one she chose. Next you show seven cards that each have a picture of a toolbox. Each toolbox is filled with different tools. 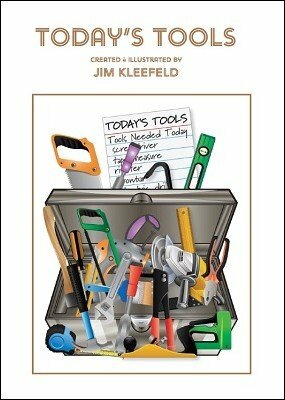 You set aside some toolboxes where the child sees her tool. Then you automatically know which tool the child has chosen. Packs flat, plays big. It's automatic-no math, no counting, no memory work, nothing to add or take away. Just show the cards and put them away and you will know the selected object. All of the artwork you need is included. Just print the pages and glue them to cardboard. 1st edition 2017, 21 pages.